Exe Valley Fishery - Spectacular Small Stillwater Fly Fishing-Happy New Year! Welcome to the first Exe Valley Fishery Catch Report of 2016. Happy New Year! Welcome to the first Exe Valley Fishery Catch Report of 2016. A Happy New Year to all our anglers and thank you for visiting in 2015. 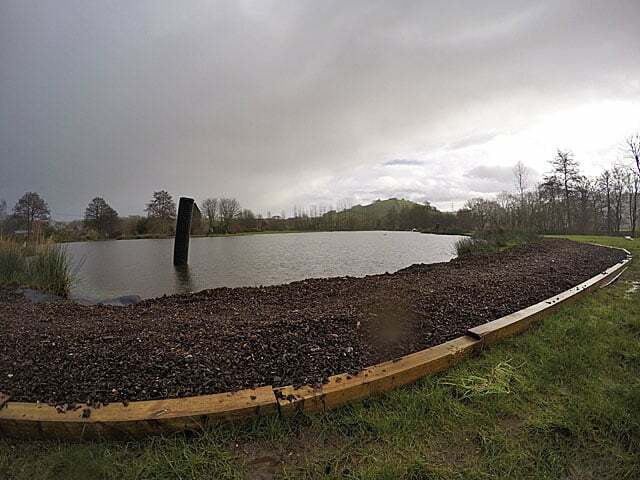 There were some big changes to the venue last year and during 2016 we aim to add even more to the Exe Valley Fishery experience. Christmas seemed to zoom past with an influx of people fishing the lakes, no doubt keen to get out of the house. One angler even fished on the day itself! The fairly settled, mild weather attracted plenty of anglers from 27th to 29th, before once again the heavens opened. The first few days of January were quiet but by last week a few anglers with New Year cabin fever decided to chance a day at the waters edge and were rewarded for the risk! Chatting with Rob Wilkinson from Exeter enjoying a Tuesday session he almost didn’t make the journey due to the forecast of high winds/rain but the risk paid off as he was greeted with a flat calm and glorious blue sky! During conversation I have heard various suggestions regarding the reasons why the local area has not flooded to such an extent during the last few weeks, despite the volume of rain. My own opinion is that the Exmoor National Park Mires Project is taking effect. The restoration of the moorland that had lost much of its water holding abilities is now holding the runoff back. This can be seen in the height of the River Exe which has remained at a fairly constant level throughout the rain, rather than going through the sudden and massive rises which so often lead to flooding. Digging the main Anchor Lake has also had a major impact on how long the venue takes to colour & clear up after heavy rain. In fact keeping the lakes clear and fishable has never been so easy, which means we needed other jobs to do! Working with my wife Sue we took advantage of some great conditions last week to create temporary paths and we even managed lunch by the water on one of the days! It has been so mild that we enjoyed a picnic by the lake while constructing the new paths ... in January?! Last week the top flies were definitely lures with Palmered Cats Whiskers and Black Taddys being favoured as go to patterns. Goldhead Daddies have also taken their fair share of fish and one or two anglers have caught on Dry Flies! Best fish of the week pulled the scales down to 7lb 8oz and was caught on a simple Red Buzzer. Floating lines are working but increasingly we find our visitors taking advantage of the greater range of depths to experiment with intermediate lines and even full sinkers. Brian Richardson called in on his way to the 2-2 draw between Exeter City & Liverpool, pulled out a super light 3 weight rod and picked up a brace ... not a bad day! He said of his visit “A great few hours on a lovely fishery. V good quality fish. I will be back” meanwhile on the same day Chris Swain dusted down his rods for the first time in several years to keep his resolution to start fly fishing again in 2016. His visit to Exe Valley set him off again with a 5 fish limit that was taken at various locations around the lakes. Chris Swain completing his first limit of Trout for many seasons under a glorious blue January sky. This is an important point to consider when fishing Anchor Lake, the Trout no longer stay in just a couple of hot spots as the new depth (area available) encourages fish to spread themselves around the venue. Which also means we are seeing far more resident fish than ever before including two huge doubles figure Trout, one a Brown the other a Rainbow. Both were stocked before the New Year and must have seen hundreds of different flies that have been cast at them during that time. Judging by the frequent angler stories of being smashed up by our fish it wouldn't surprise me if both these specimens haven’t been hooked for brief periods at some point! They have been spotted on a few occasions during the last week and must be getting hungry so its only a matter of time before someone gets very lucky indeed! Other notable catches include Bob Stoneham with a bag of 5 caught on a Goldhead Daddy weighing 14lb, 6 between Jono & Dennis Enticott weighing 19lb and 4 weighing 15lb 8oz, including a best fish of 6lb 9oz to Exe Valley regular Chris Short while Pat Lehain forgot to pay for his tagged Trout entry and then managed to catch one! Even so he was pleased with his 4 fish bag and said “Great day as usual, fish fighting well in cold water” There are still 3 fish worth a £10 prize swimming around the lake and another 3 worth £20! Thank you for reading as always and once again we hope that you have a very happy new year with plenty of fantastic fishing to enjoy.